I see some questions that I'd like to see migrated instead of just closed. For example, this one: What can I do as a student to be a better candidate for a hardware design job? So, can we have more migration options? What should these options include? For now, I'm thinking of SuperUser, StackOverflow and DIY. What are your thoughts? We added Super User as a migration path, but we don't feel there's enough data right now to warrant adding Physics, DIY, et al at this time. If the need arises in the future, just make a meta post and let us know -- just like you did here! The flag menu matches the close menu exactly. They change together and there has to be a need for there to be an item added to the list. Now, an important point, at least to me, is that these migrations only track those that a diamond moderator saw and approved. That means, and I know this to be the case, there are many many more "rejected" migrations for all of them. Sadly, I can not easily pull statistics on that so I have added a note. 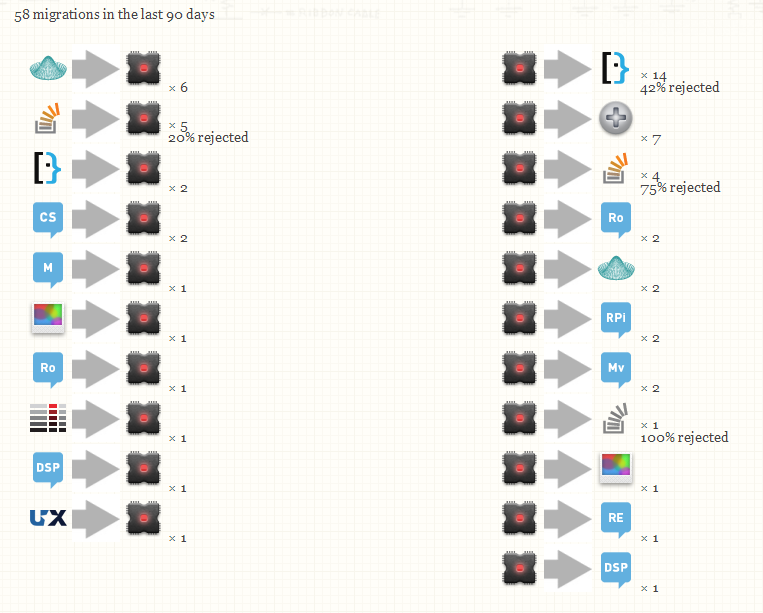 Looking at this, it might make sense to add at least Super User, maybe even DIY/Physics/math. I will contact the SE comm team and see their thoughts. 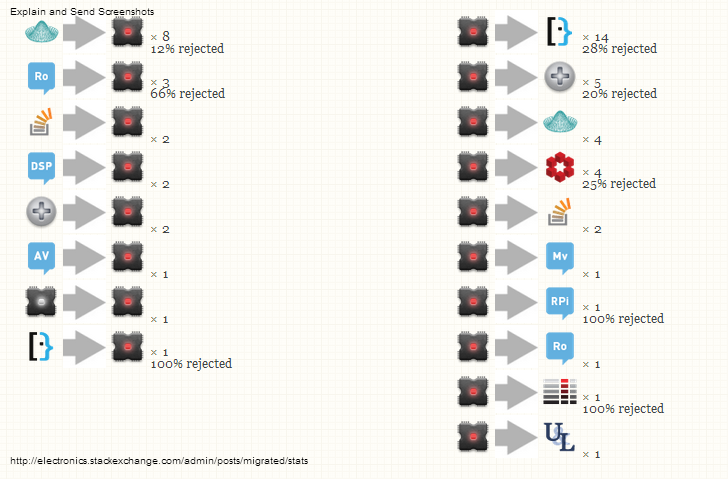 Updated migration information as of 2013/8/7. Updated migration information as of 2013/9/3. I don't know if it's changed or I just have some issue, but I NEVER see anything but the meta group for a migration option, and the meta group is usually not a good option when I think of migrating. I would suggest a migrate options list that is sensitive to the reputation of the person suggesting the migration ON THE SITE THEY SUGGEST MIGRATING TO. 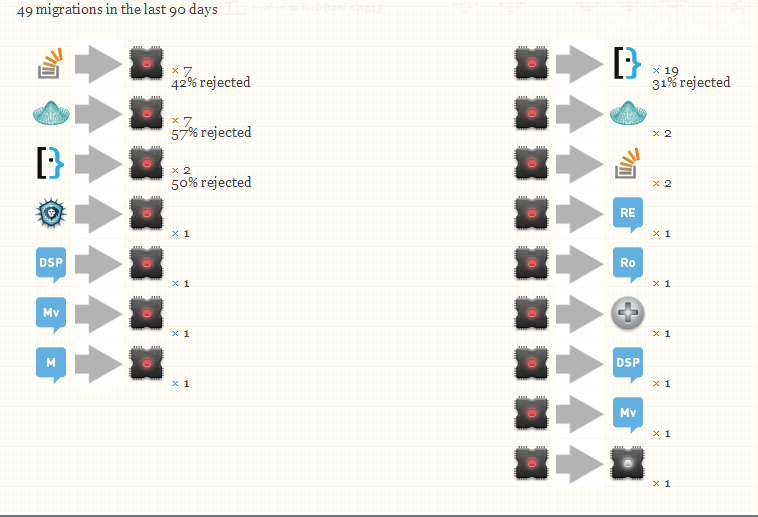 I have certainly seen high-ranked moderators on site A who know nothing of the culture on site B send lousy migrations. Someone, even someone with a rep of 101 on site A, who is a 3K, 5K or 10K rep on site B is going to know that "this question belongs on site B", and should be able to suggest that, easily and sensibly. That should cut WAY down on rejections, and ALSO cut way down on questions that are closed because there is no sensible way to suggest migrating them where they need to go. "You can submit a custom flag" Well, no, you can't, FROM THE MIGRATION page. You SHOULD be able to make a suggestion on the migration page, but you can't, actually. You have to take 3 steps back and wonder how much you're wasting your time by making a generic "other" flag to suggest a specific thing (migration) for which there is already a (mostly broken, IMHO) work path. The current number of migrations completely fails to capture the questions that are simply closed without even a migration attempt, when there might have been a good place for them to be answered. There is a raspberry pi board that would be useful. Server fault: I hear they run a pretty "tight ship" over there, though I'd think for some networking questions they might be better than SU. Programmers/Theoretical CS are probably not relevant enough. Unix and Ubuntu we don't have enough issues for, which is sad. There should be more router tinkerers here. 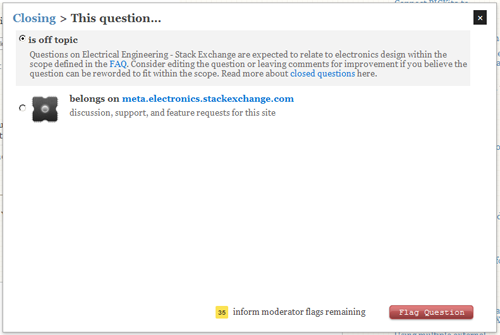 It be nicer if there were more options for that, instead of the questions being marked for closed. DIY is a common one I would flag for. Is there a way to have a open ended option for the Off Topic/Migration close? A box where we can type in where and why, so it will be counted. While we can just flag, it would be better in allowing the mods to keep track of what migration paths are needed. Not the answer you're looking for? 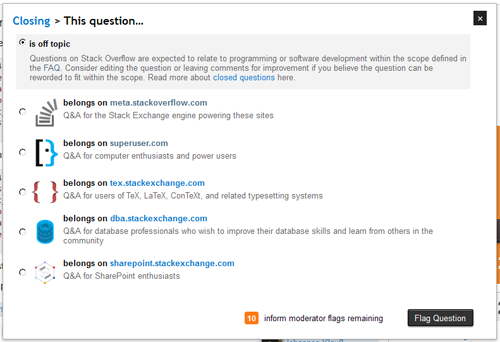 Browse other questions tagged discussion feature-request status-completed migration flagging . What will be the benefits in having a separate Arduino site? When to reference and is a simple reference ever enough?